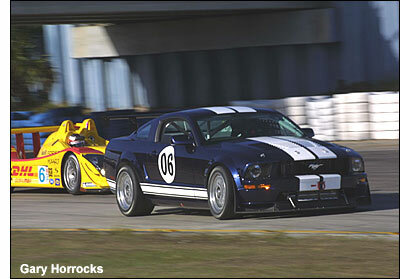 The Mustang that made an appearance at Sebring testing earlier this week is sort of an orphan – writes Gary Horrocks. In essence, as it sits right now, it is a car looking for a place to race. Designed with the Rolex GT class in mind, it is based upon the stock configuration of a street Mustang. As such, it is classified as a Prep 1 car, but as of now the 2005 Mustang is only approved as a Prep 2, or tube framed car. Ford, which has taken a lot of heat for producing a “performance” car with a live axle, is justifiably proud of what they have accomplished on the street car, and would prefer to race what they produce. Because the Prep 2 cars are mandated with transaxles and independent rear suspension, Ford would see this as a negative step in the promotion of their Mustang. So, what was it doing at Sebring? It was in essence an exploratory attempt to see where the car might fit in. The ALMS gave permission for Mutimatic to run the car, but do not view this as a sign that their commitment to the Panoz effort is wavering. 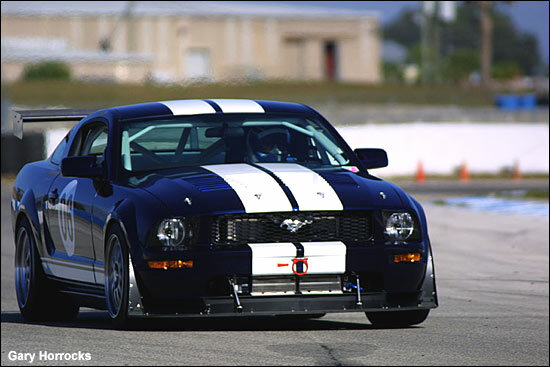 As the only place that the Mustang currently might slot into ALMS competition is in the GT2 class, don’t expect to see that happen, especially in the near future. GT3? Maybe, but as of now, there is no place for that category in the ALMS. Lap times were reported to be in the 2:15 range, right where Larry Holt of Multimatic had predicted. As an aside, the efforts of Multimatic have brought in a larger presence from Ford, as noted on the windshield banner on the Panoz. While it is not to be viewed as a full factory supported program, Ford is committed to developing their modular based V8 for competition, of which the basic configuration is the same in both the Panoz and Mustang. As such, Ford will be pushing the development of this motor in conjunction with builders such as Yates, Roush and Elan.